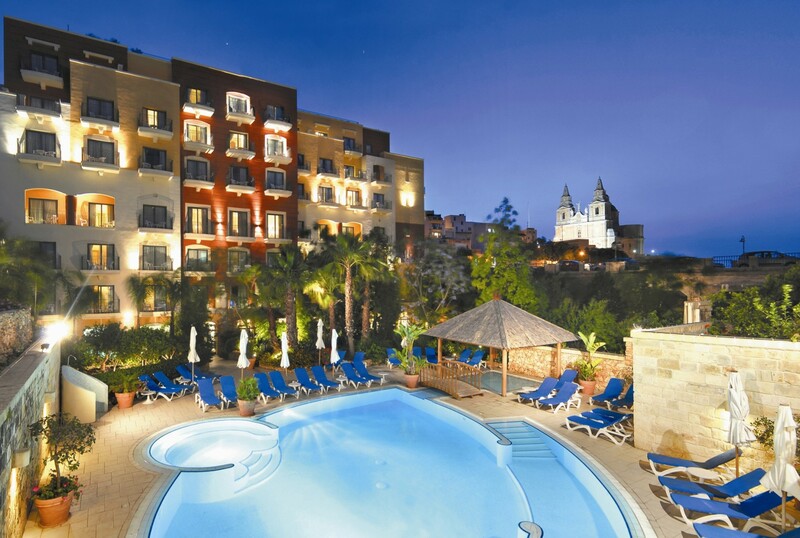 The Maritim Antonine hotel & Spa, situated in the beautiful Maltese town of Mellieha, is the ideal hotel for those looking for a relaxing break away with the family. With a fantastic array of both indoor and outdoor facilities, including a choice of three pools and restaurants, this hotel caters for everyone, ensuring the whole family has a fun and enjoyable stay. At the Maritim Hotel & Spa you will never be stuck for things to do. Whether you are looking for an action-packed day of water sports with the kids or in need of some rest and rejuvenation at the onsite spa centre, we have something for the whole family. Outdoor facilities include a full-sized pool complete with its own pool bar and a shallower pool for children. With sun loungers in abundance, you can relax and keep a watchful eye on your little ones from the poolside. The hotel recently unveiled its new chic rooftop pool, boasting stunning views over the Mediterranean. A great new addition, the rooftop pool is a great place to relax and appreciate the spectacular scenery. After a morning at the pool with the family, head down to the large garden area where the kids can run around in the safety of the hotel grounds. Not only does the Maritim Hotel & Spa boast fantastic outdoor facilities, it has a wonderful selection of indoor facilities to keep the whole family occupied. Truly unwind in the relaxing spa centre where you will find a sauna, jacuzzi and treatment rooms. Various treatments are also available for guests including a range of holistic massages, facials and the invigorating exfoliation and body wraps. For those who enjoy working out, there is a fully equipped hotel gym and fitness room where guests can exercise. The heated indoor pool is a great addition where your family can relax away from the sun in summer or during the winter months when temperatures are cooler. Children can also hang out in the air-conditioned games room, where they can play and make new friends. Priding itself on providing its guests spacious and comfortable accommodation, the Maritim Hotel & Spa goes out of its way to ensure guests have a relaxing stay. With a range of rooms the hotel can cater for smaller families and larger groups. For families, balcony or balcony garden side sea view rooms can facilitate two adults and two children as well as a Family Junior Suite which includes a comfortable sofa to relax on. 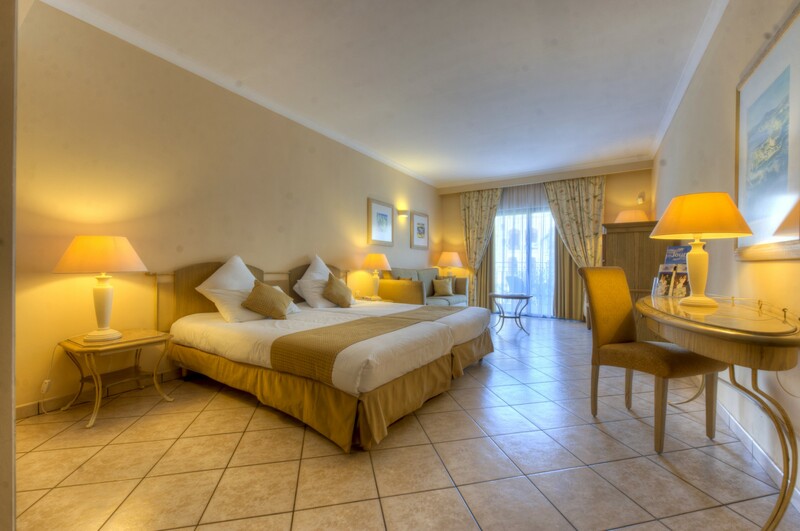 These spacious rooms are elegantly decorated with Italian furnishing and a warm colour scheme and come complete with free wi-fi, on suite bathrooms and flat screen televisions. A nice feature is the addition of adjoining rooms, which are ideal for larger families. If you are looking for a luxurious stay, the Suites come with a plenty of extra luxuries and a balcony with views of the sea and garden area. Exquisitely decorated, these rooms provide an extra touch of class to your holiday and are suitable for families of up to four people. For a truly memorable stay why not treat your family to the Suite complete with its own outdoor swimming pool and large terrace as well as a kitchenette, dining area and ‘chill out’ zone. For more information on the accommodation available at the Maritim Hotel & Spa do have a look at the ‘Accommodation’ and ‘At a Glance’ sections on the hotel main page. 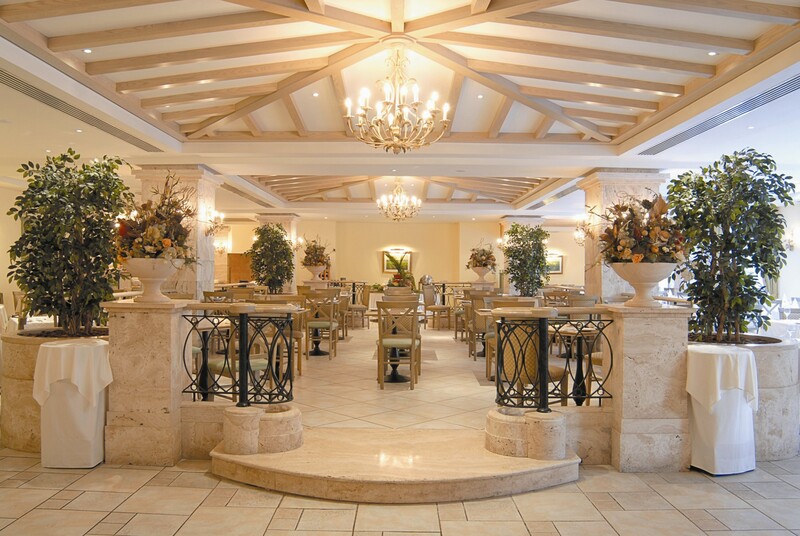 The Maritim Hotel & Spa has an excellent choice of restaurants for guests to choose from. From the lavish morning buffet breakfast to the exquisite themed evening meals and barbeques served in the Les Jardins main restaurant, guests at the Maritim are never left feeling peckish. During the day, make the most of the bistro and pool snack restaurants available to guests. Take the family to sample the delights of traditional Maltese cuisine at The Arches fine dining restaurant, adjacent to the hotel, where guests at the Maritim gain special concession. Renowned for its service and charming elegance this is a real treat to be enjoyed with the family. As well as a large selection of restaurants, the hotel has a number of family friendly bars. Relax during the day with a cocktail by the pool from the poolside bar or cheer on your favourite sport team at the 120 sports bar or relax at sunset with a cocktail from the Le Mirage cocktail bar. With its fantastic array of both indoor and outdoor facilities as well as spacious family rooms, the Maritim Hotel & Spa is the ideal option for those looking for a relaxing holiday for the whole family.